Batteries come with a certain voltage limit and if the voltage goes beyond the prescribed limits while charging or discharging, the life of the battery get affected or reduced. Whenever we use a battery powered project, sometimes we need to check the battery voltage level, whether it is needed to be charged or replaced. This circuit will help you to monitor the voltage of your battery. This Arduino battery voltage indicator indicates the status of the battery by glowing LEDs on a 10 Segment LED Bar Graph according to the battery voltage. It also shows your battery voltage on the LCD connected to the Arduino. The LED bar graph comes in industrial standard size with a low power consumption. The bar is categorized for luminous intensity. The product itself remains within RoHS compliant version. It has a forward voltage of up to 2.6v. The power dissipation per segment is 65mW. The operating temperature of the LED bar graph is -40℃ to 80℃. There are many application for the LED bar graph like Audio equipment, Instrument panels, and Digital readout display. The complete Arduino code and Demonstration Video is given at the end of this article. Here we have explained some important parts of the code. Here, we are defining the LCD library and specifying pins of LCD to be used with the Arduino. The analog input is taken from pin A4 for checking the battery voltage. We have set the value as Float to get the voltage up to two decimal. The array is made for assigning the pins to the LED bar graph. Setting up LCD and the analog pins (A0, A1, A2, A3) as OUTPUT pins. Here, we make a function for using the LED bar graph to use in a simple manner, you can even glow the LEDs by programming them one by one , but the code get lengthy. In this part, we have read the voltage value using the analog pin. Then, we are converting the analog value into a digital voltage value by using the analog to digital conversion formula and displaying it further on LCD. 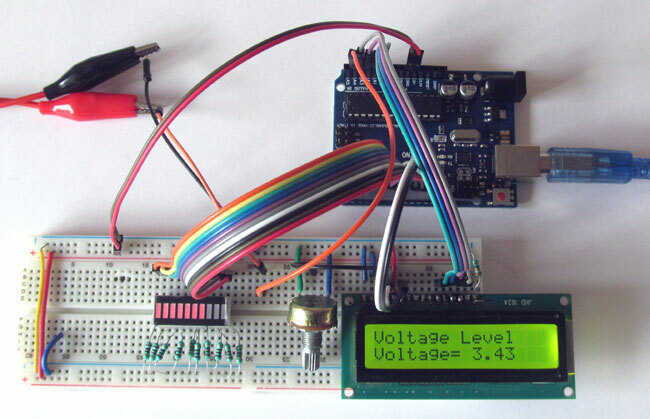 Battery Voltage Indicator just read the value from Arduino Analog pin and convert it into a digital value by using the Analog to Digital Conversion (ADC) formula. The Arduino Uno ADC is of 10-bit resolution (so the integer values from 0 - 2^10 = 1024 values). This means that it will map input voltages between 0 and 5 volts into integer values between 0 and 1023. So if we multiply input anlogValue to (5/1024), then we get the digital value of input voltage. Learn here how to use ADC input in Arduino. Then the digital value is used to glow the LED bar Graph accordingly. I like to build a short distance measurement kit which read mm or less precise distance. YOur circuit is well constructed and thought out. Would you tell me what code language is used? Thank you. nice project. you have a 5v battery for your project but in my project i have a 24v and 14 amph battery what i do for battery indicator. This battery indicator only measures the voltage across the battery terminals and displays it on the bar graph. If you connect a charger to the battery, the battery will charge and as the battery gets charged the voltage value will increase and also the bar will increase. Wow thank you for your reply. May i ask again, is the Circuit Diagram correct? I manage to follow the circuit diagram my LCD won't go on even my 10 Segement idk i f the circuit is correct i checked my pins and repeated the process, Does it need a function generator to make my LCD work or would it be okay for the meanwhile w/o a Function Generator to see my work is correct? May i ask again, if it its okay for the 10 Segment LED Bar Graph, if we use a 7 Segment LED Bar Graph rather than a 10 Segment LED Bar Graph? Please i need your help, would the LCD print the Voltage in the screen w/o any function generator?